Click on the photo below or HERE to take you to our Ultimate Map of Paris. We finally decided to put all of our favorite spots in Paris in one spot. 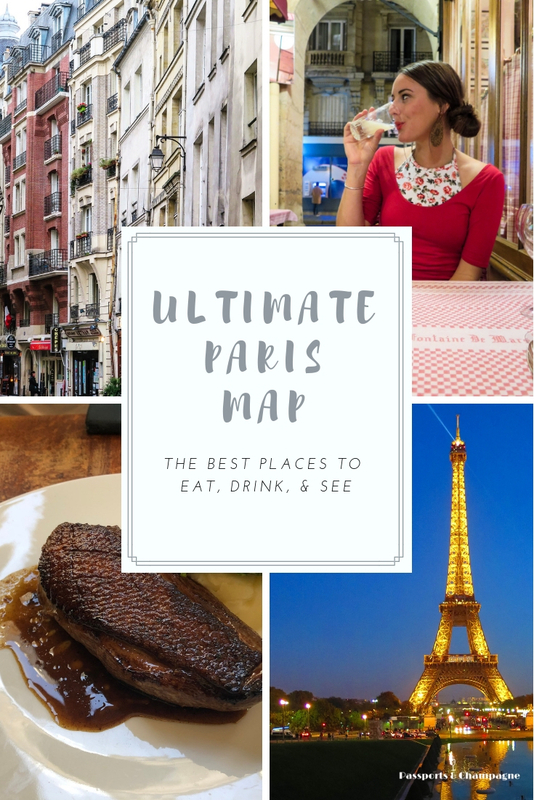 We created a map with Google maps HERE that shows all of our top spots to eat, drink and see in Paris. Below is a list of most of the places listed on the map as well. We hope you find yourself in Paris and are able to visit some of these places! This cozy Provencal restaurant makes food the way you'd expect your French grandmother to make it. People love this place and it's authenticity. Make sure to order the chocolate mousse at the end of the meal which comes out in giant bowl where you literally eat as much as you please. Everything from the duck breast to the rabbit is exceptional. This is a pastis bar also, if you have never had this magical anise flavored elixir this is the spot to indulge. Pastis is the most "French" thing you can drink, and at Chez Janou they have over 80 different kinds. This little neighborhood spot is one of our favorites. This classic French bistro has it all. It’s a famous little spot (mostly because Obama ate here) but it's close to the Eiffel Tower. This place shouldn't be missed if you are in the area. All the food here is amazing, like the pumpkin soup with foie gras, chicken with morel mushrooms, and seared duck breast with blackberry compote. Michelin Star charcuterie by a young chef. Come in and try the charcuterie board along with a glass of wine. Or simply walk up to the counter and grab a slab of his incredible terrine to-go. Our recommendation: buy some of their famous poultry pie with foie gras, a baguette from a nearby patisserie, some cheese from a fomagarie, and a bottle of wine. Then walk to the Eiffle tower which is literally right around the corner and have a picnic on the grass. A moment in Paris you will never forget. Two words - Steak frites. That is all this place serves. You sit down at your table and they ask how you would like your steak cooked. A plate of filet mignon and fries comes drenched in the most delicious sauce. When you finish the waitress comes by and dishes you up another plate. This place does one thing and they do it perfectly. There is always a line out the door but it's worth the wait. Go early to one of the three locations and you can get right in! Incredible food! This little place has a small but phenomenal menu. It also has a small grocery section where you can buy a lot of different local delicacies to take with you. If you come here make sure to order the foie gras ravioli in a truffle sauce. One of the best bites of food we've ever had! Make a reservation or be prepared to wait in line, but trust us this place is worth the wait. One of the coolest tapas places on earth. This tiny standing room only wine/tapas bar serves up small bites to die for. The menu is in the form of dozens of signs hanging from the ceiling with photos on them. Look up and order everything, especially the foie gras on the stick! We also love the huge slabs of butter, homemade bread and gherkins that line the bar top, and keep you company while you wait for your food. This place was a favorite of Anthony Bourdain and is one of the places we always visit when we come to Paris. With a ton of history this legendary brasserie is one of the most famous in Paris. It was the hangout for what Gertrude Stein called “The Lost Generation” of Parisian and American artists like Picasso, Hemingway, and Fitzgerald. And one loyal customer, Josephine Baker will forever be remembered at La Coupole for regularly bringing her pet cheetah to dinner with her. The seafood platters are what's to order here.They come with insane portions of fresh oysters, crab legs, and shellfish. This area of Paris is a often overlooked by guests because it’s a little bit on the outskirts of town. But if you ask us, this area has some of the best history. This legendary french bistro has amazing food and is one of the hardest places to get a reservation in Paris. Luckily there is Frenchie Bar à Vins and Frenchie To-Go across the street, where you can get a taste of chef Grégory Marchand’s delicious food without a reservation. One of the places we plan of dining at on our next trip to Paris is April. With an ever changing seasonal menu and a brilliant young chef, Robert is at the top of our list of places to try on our next trip to Paris. We have a reservation! So more details to come after our trip in April. The best Mexican food in Paris. Walk through the unmarked door to find a hopping little spot with fresh tacos, margaritas and delicious cocktails. Oyster and seafood focused small plates with a modern twist. Also has a solid cocktail program. We have reservations here our last night in Paris this upcoming April. We can’t wait to see what this place is all about. This restaurant is said to be one of the most thrilling in Paris! With a uniquely innovative menu with items like veal brains, we can't wait to check this place out on our next trip to Paris! We already have reservations here and will update this afterwards. An amazing brunch/breakfast spot know for delicious food and great coffee. If you are going for brunch on the weekends make sure to go early or make a reservation. One of the best restaurants in Paris! It's very difficult to get a reservation here but if you do you will be rewarded with a legendary meal. Classic french bistro with dishes like, steak frites, duck breast, rabbit and more. Need a break from French food. This ramen place is legendary. Inside you will feel like you have been transported to a back alley of Tokyo. Their ramen is some of the best we've ever had and the ambiance made it even more wonderful. Try the Kurogoma Ramen or "Our Specialty" it was absolutely delicious with a black sesame broth, pork belly, veggies, seaweed, a perfect egg and of course delicious noodles. It went down even better with an Ichiban beer on draft. Cute as a button. This light pink cafe is Instagram famous. It also was a favorite place of Picasso back in the day. Picturesque french bistro. We stumbled across this place when walking around Montmartre and has the most delicious steak tartare. One of the cutest little cafes in Paris. The greenery growing on the outside of this cafe is beautiful and worth a photo. You can find this little gem tucked on the island near Notre Dame. One of our favorite bars in Paris. Situated along the Canal St. Martin, look for the unmarked green doorway and head through into a different world. This quirky bar has several different rooms one of which has a giant pirate ship bar. grab a mojito or rum punch and enjoy this unique bar. A rad gin bar serving delicious craft cocktails. Tiger is one of many bars and restaurants that line the cobblestoned street of Rue Princess. We love to come to this popping area in the Latin Quarter for a fun night out. A hidden gem with an unmarked door. If you are lucky to find this bar you will be rewarded with one of the most intricate and crafty cocktails in Paris. A cocktail bar behind, you guessed it, a little red door. Great cocktails and a fun atmosphere. A fun cocktail bar that we are excited to check out on our next trip to Paris. A lively bar with great drinks and delicious food. A Paris institution. A funky nightclub with old school Parisian flare. Another place we are excited to go check out on our next trip to Paris in April. With two locations, one by the Louve and one on the outskirts of Luxembourg Gardens this place is famous for it’s African Hot Chocolate. It’s thick, rich and decadent. You’ve never had a hot chocolate like this before. We stumbled across this super old cafe on the island near Notre Dame. It was packed with people all here for their amazing thick hot chocolate and fun hot teas. Our favorite patisserie in Paris. This little spot is always packed with locals picking up a freshly baked baguette, quiche, pastry, or sandwich. We luckily stumbled into this place and now try and return every morning we are in Paris for a croissant and pain au chocolate. These croissants are flaky perfection! A delicious patisserie spot! Try the pistachio twist or escargot. World famous bakery known for their sourdough loafs. Head to 2nd arrondissement and set off on a treasure hunt to find the covered passageways of Paris that are hidden throughout the city. These ornately decorated tunnels have mosaic floors and glistening glass roofs. Each passageway is unique, some contain bookstores, others cafes and wine bars. Our favorite is the Passage des Panoramas. Grab a glass of wine in a hip bistro under the glass ceiling and watch Parisians stroll by. This classic European street market gives you a small village feel inside Paris. This pedestrian only street is lined with stores and stalls that sell the freshest ingredients in the city. Locals shop here daily. The Fomagerie on the corner sells over 400 types of cheese. Rue Cler is close to the Eiffel Tower, so we usually grab some cheese, charcuterie, and a bottle of vino and then walk to the Eiffel Tower for a picnic on the grass. A great time to come to Rue Cler is in the early morning so you can see all of the chefs buying all the fresh ingredients for their restaurants. Don't be afraid to slurp down an oyster from the seafood stall, and trust us when we say you do not want to leave this street without eating a hot quiche. And if you are looking for more of a sit down meal there is the cutest little bistro on this street called Le Petit Cler. Order a croque madame here, you won’t regret it. This is a really fun pedestrian only street in the Latin Quarter that is filled with bars and restaurants. Come here at night to mingle with the crowd as you bar hop down the street. Besides being a very local and historic area of Paris, the Canal St. Martin is great place to explore if you are a foodie. Some of the most iconic restaurants in Paris are located close by. This canal is a perfect place to stop, slow down and enjoy being in Paris. It can be spotted in the movie Amélie and is the perfect place to bring a bottle of vino on a sunny day. Hang your feet over the edge of the canal and soak in the sunshine! And if you fancy a cocktail make sure to head over to Le Comptoir Général, one of our favorite bars in Paris. A really fun pedestrian only area filled with tons of restaurants and bars. If you love cheese like we do and are looking to get that fondue or raclette fix, look no further. This rad little area has a bunch of different restaurants that specialize in those gooey melted cheeses. After dinner hang around this area for a while, you will find lots of locals sipping drinks in the many bars around. One of our favorite and sometimes overlooked areas of Paris. Go back in time in as you walk around the area of Paris called Montparnasse. Here you will find a lot of the old bars and hangouts of Hemingway, Fitzgerald and Picasso. Some of the restaurants in this square were home to some of the crazy parties of this group of people and the birthplace of the art movement that changed the world. Only a couple steps around the corner from the Sacre Cour is the "Painter's Square." Considered the heart of Montmartre this square was once a the hippest gathering place for artists, poets and composers. Now the square is full of artists painting on canvases and selling their artwork. You need a permit to sell your art in this square and because of the prestige the waiting list is over 10 years! Walk to the edge of the square for an unbeatable view of the city below. A must stop for anyone in Paris should be this famous historical little bookshop. After browsing for books walk down the street to see Odette's pastry shop. One of the cutest facades in Paris. And then walk across the bridge and marvel at Notre Dame. This is a beautiful little corner of the world. One of the most beautiful churches in the world. Make sure to go inside to view the incredible ceiling with Jesus overhead. And from these steps is one of the best views of Paris. A must see for anyone visiting Paris. We love to sit on a sunny day and have a picnic on the lawn with a bottle of wine. One of the most romantic spots in the world..
Great outdoor museum, perfect for a sunny day. The sculptures here were amazing. Home to the famous statue "The Thinker". Everyone needs to spend a day exploring the Louvre. One of the grandest museums in the world. See the famous Mona Lisa and other legendary works of art. We loved the Egyptian area and the Winged Victory of Samothrace. You could spend multiple days wandering these halls and still not see everything, its one of the most fascinating museums on earth! The most energetic and historical part of Paris, the Latin Quarter is made up of alleys that are packed with adorable french bistros, & bars. Look for Les Deux Magots which is one of the most historical bistros in the area. Have fun getting lost amongst the crowded cobblestone streets and stop for a cappucino in one of the many outdoor seating areas and watch Parisian life pass you by. Another one of Paris’ incredible museums. Built on the Left Bank and inside an old railway station, just the architecture and beauty of this building make it worth a visit. It is also home to some famous art like the “Self-Portrait” by Van Gogh and other masterpieces by Monet. The most beautiful and well-known avenues in Paris. It connects the Arc de Triomphe and the Place de la Concorde. Take a stroll down this beautiful street and window shop at some of the most high-end stores in the world. There is also some great fine-dining options in this area. Sign up for more new and updates from the road.